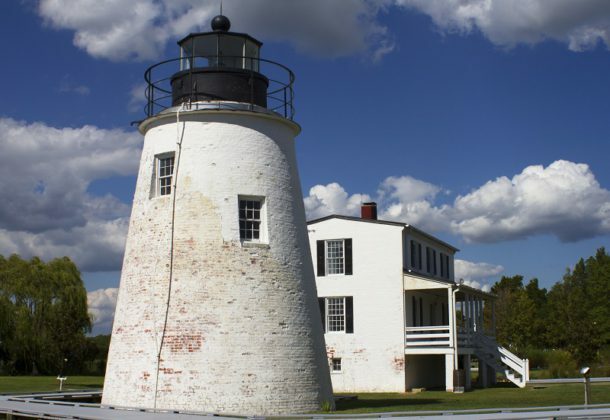 The “Offshore Lighthouses of the Potomac River” exhibit has opened at the Piney Point Lighthouse Museum and Historic Park in Piney Point, MD. The temporary exhibit will run until January 2020. It includes three interpretive panels with information regarding all 14 lighthouses on the Potomac River, and is part of a new educational program which commenced in 2017 under the supervision of the Chesapeake Chapter of the US Lighthouse Society. The exhibit will be on loan to the St. Mary’s County Museum Division until January 2020. The goal of the program is to educate the public about the history of the lighthouses offshore on the Chesapeake Bay and Potomac River, both existing and those no longer standing. The display contains research performed by the Chesapeake Chapter on all of the lighthouses at both the US Coast Guard Historians Office and the National Archives. During the planning stages in 2017, it was decided to expand the original program to include placing historical placards at government facilities near where the lighthouses stand or where they once stood. Included with the exhibit is a historical placard on the Piney Point Lighthouse, which was generously provided to the St. Mary’s County Museum Division free of charge by the Chesapeake Chapter. For more information regarding “Offshore Lighthouses of the Potomac River,” call the Piney Point Lighthouse Museum at 301-994-1471. For hours of operation, programs, admission prices, and more, visit the St. Mary’s County Museum Division’s Facebook pages at www.facebook.com/SCIMuseum or www.facebook.com/1836Light or on Twitter at @StClemIsMuseum or @PineyPtLHMuseum.